Buy a barrel of whiskey in bottles, and take the empty barrel home with you. The advantage? YOU decide when it’s ready to drink. We are often asked about buying a barrel of whiskey. While the law prohibits us from selling whiskey in barrels, we can sell a barrel of whiskey in bottles, and then present the empty barrel to the buyer. The advantage of this approach is that you can let it age until you decide that it’s ready to drink. 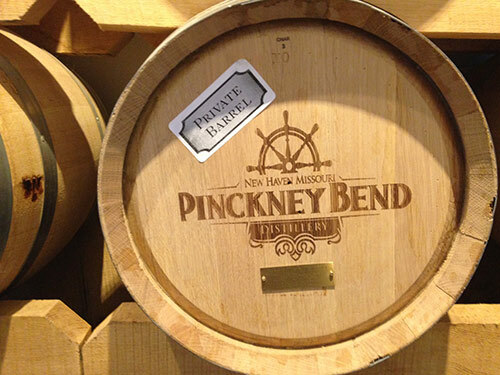 Pinckney Bend will set aside a new, 15-gallon Missouri White Oak barrel filled with new whiskey fresh from the still, brought to a barreling strength of 120 proof. The only difference between your barrel and every other barrel in the distillery will be a unique serial number and a brass plate on the head, inscribed with your name. You can follow the progress of your barrel by tasting samples every few months. This is perhaps the most fun and informative part of owning your own barrel of whiskey. It is certainly the best part of owning a distillery! Our award winning Rested American Whiskey generally takes about a year to mature. But maturity is a judgment call. When you own the barrel, you make the call. If you want to give your barrel another year or two of age, it’s completely up to you. When you determine that it is ready, you can then help bottle and label it. We will apply an additional label identifying the whiskey as your own. You also take home the empty barrel. Download a pdf of our barrel purchasing program brochure. A 15-gallon barrel of whiskey barrel will generally produce between 65 and 75 bottles (750mL). Variables include evaporation (3%/year), how often you sample, and the desired proof of the finished whiskey. The total cost, including sales tax, is in the neighborhood of $3,270.